In preparation for the upcoming 2014 World Cup and 2016 Summer Olympic Games, the city of Rio de Janeiro, Brazil, is currently undertaking massive construction projects in sports and urban infrastructure. While the long term social effects of stadium renovations and subway extensions can be questioned, some planning and architectural projects are unquestionably improving the lives of the general citizenry. One such project, a cable car system servicing the favela complex of Alemão, was inaugurated Thursday by Brazilian President Dilma Rousseff, Rio de Janeiro Governor Sérgio Cabral, and Rio de Janeiro Mayor Eduardo Paes, amongst others. The Teleférico do Alemão is the first system of its kind in Brazil, and is the first true mass transit system in this or any slum in Rio. The system is the work of Alemão PAC (Growth Acceleration Plan), and part of an urban revitalization program started under former President Luis Inácio Lula da Silva. Ranging from the establishment of basic sanitation and services to new housing and social services, the project by the design office of Jorge Mario Jáuregui provides the residents of this sprawling hillside community an urban support system to foster growth and opportunity. The Teleférico is a 6-station funicular system based on those built in similar communities in Medellín and Caracas, resolving transportation issues in conjunction with other social maladies in one single project in order to reconnect these slums with the rest of the city. Three and a half kilometers long, the aerial course eases mobility and transportation along the sprawling housing complex, shortening travel time between its two extreme stations from 50 minutes by foot up and down unpaved hilly streets to a pleasant 16 minute ride with panoramic views of Rio’s landscape. In order to serve the 120,000 residents of Alemão, 152 cabins fitting ten people each move almost continually between stations, carrying three thousand passengers per hour. The system connects each of the complex’s principal favelas to the city’s mass transit. At each station, mini-buses and other conventional transportation methods are available; at Bonsucesso’s terminal station, an intermodal transit node provides transfers to commuter rail lines towards the center of the city. While the physical transport infrastructure serves its purpose on paper, financial and social incentives had to be put in place to win the trust of the community and encourage use of these facilities. The Alemão complex has been a stronghold of Rio’s drug trade for decades, and only a recent military raid seems to have eased the constant threat of crime. Residents are beginning to recreate their lives, and must learn to trust the incoming peace-keeping police forces, politicians, and social workers. To kick-start this process, residents are given a free, daily round trip on the Teleférico, easing the financial burden on this poor constituency. Additionally, each station provides a public service, including job training, education, medical services, and legal advice. Neighborhood groups and other local organizations are given spaces to convene, discussing common values, and emphasizing economic and environmental sustainability of these precarious settlements. Social services provided by the Alemão Growth Acceleration Plan (PAC) is not limited to the six stations and a transportation system. In order to truly improve the livelihood of these favela residents, and to fulfill the infrastructure improvement mission of the Growth Plan, glaring basic services had to be addressed. When completed, the entire urban renewal project will include 39,000 meters of water lines, 42,000 meters of sewage lines, 153,000 square meters of paved streets, and 22,000 meters of drainage. Natural drainage and community gardens were proposed in the original design, and along with the preservation of adjacent parkland provide a sustainable backbone for the project. Replacement housing is under construction for residents displaced by the ongoing work and new facilities; over 900 families will be relocated in total. Most of these apartments are completed and have become community nodes on their own, providing leisure, health, and educational services to complement programs situated in the cable car stations. 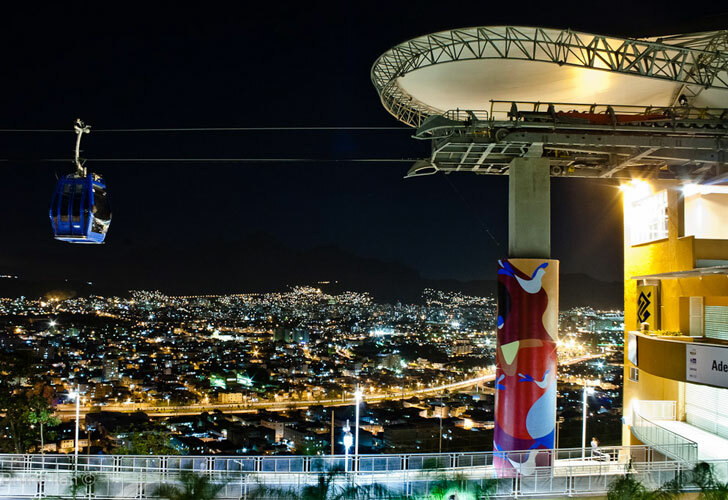 Together, the brand new Teleférico do Alemão and the PAC do Alemão could provide a blueprint for the urbanization and inclusion of the favela into the rest of Brazilian society, proving the power of thoughtful design as a democratizing mechanism. 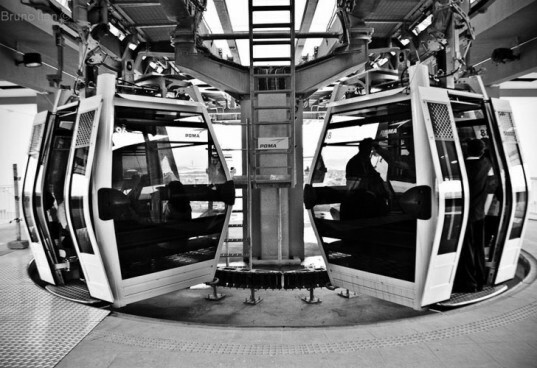 The Teleférico is a 6-station funicular system based on those built in similar communities in Medellín and Caracas. Three and a half kilometers long, the aerial course eases mobility and transportation along the sprawling housing complex. Travel time between the two extreme stations is shortened from 50 minutes to a pleasant 16 minute ride. Residents no longer have to make the winding journey by foot up and down unpaved hilly streets. The cable car trip affords residents panoramic views of Rio's beautiful landscape. In order to serve the 120,000 residents of Alemão, 152 cabins fitting ten people each move almost continually between stations. Three thousand passengers can be transported through the entire system each hour. 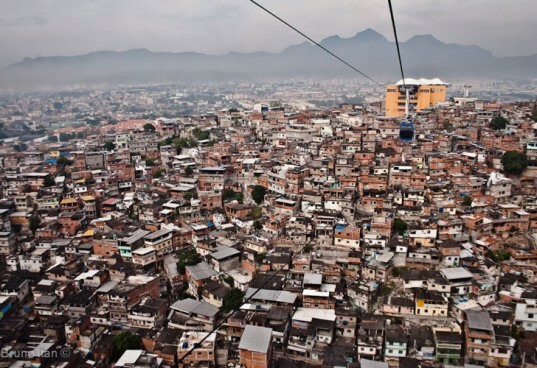 Residents are given a free daily round trip on the Teleférico, easing the financial burden on this poor constituency. While the physical transport infrastructure serves its purpose on paper, financial and social incentives had to be put in place to win the trust of the community and encourage use of these facilities. The Alemão complex has been a stronghold of Rio's drug trade for decades, and only a recent military raid seems to have eased the constant threat of crime. Each station provides a public service, including job training, education, medical services, and legal advice. Neighborhood groups and other local organizations are given spaces to convene at various stations. In order to truly improve the livelihood of these favela residents, and to fulfill the infrastructure improvement mission of the Growth Plan, glaring basic services had to be addressed. When completed, the entire urban renewal project will include 39,000 meters of water lines, 42,000 meters of sewage lines, 153,000 square meters of paved streets, and 22,000 meters of drainage. Natural drainage and community gardens were proposed in the original design, and along with the preservation of adjacent parkland provide a sustainable backbone for the project. Replacement housing is under construction for residents displaced by the ongoing work and new facilities; over 900 families will be relocated in total. Most of these apartments are completed and have become community nodes on their own, providing leisure, health, and educational services. The housing complexes complement programs situated in the cable car stations, providing this neglected community with much-needed services. 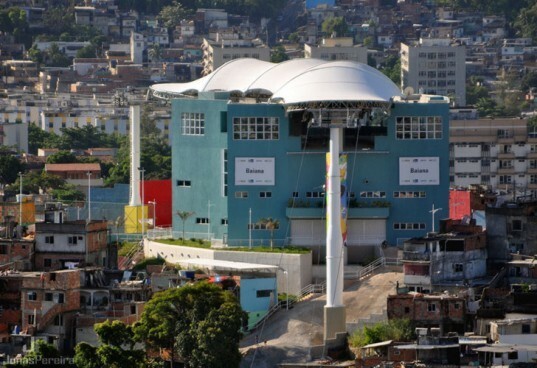 The brand new Teleférico do Alemão and the PAC do Alemão could provide a blueprint for the urbanization and inclusion of the favela into the rest of Brazilian society, proving the power of thoughtful design as a democratizing mechanism.